In the 1993 music issue of Details there was a fashion spread starring Anthony Kiedis, his girlfriend Sofia Coppola, Debbie Harry, Kim Gordon, Thurston Moore, and a bunch of beautiful drag queens. The magazine came with a pull-out poster for the make-believe movie that the fashion spread was supposedly based on; it was called Sick: A Love Story, and I kept that poster taped to my wall for all of eleventh grade. Anthony was my favorite (still is!) and I had a strange fascination with Sofia, who at that point was 22-years-old and mainly known to me as one of the disco-hippie girls eating bananas in the video for "Deeper and Deeper" by Madonna. Until last Thursday, when a benevolent stranger emailed me a link to the YouTube video below, I never knew that Sick really was made into a short film. It's directed by Paul Morrissey (who made Chelsea Girls and a bunch of other Andy Warhol movies), and it's so goofy and fun and absolutely worth waiting 21 long years for. Something that's kind of a drag: in place of the actual audio for the movie, there's this super-bizarro mish-mash of George Gershwin, late-'80s Red Hot Chili Peppers, Jane's Addiction, and some insane metal/faux-opera hybrid that I can't and don't want to identify. 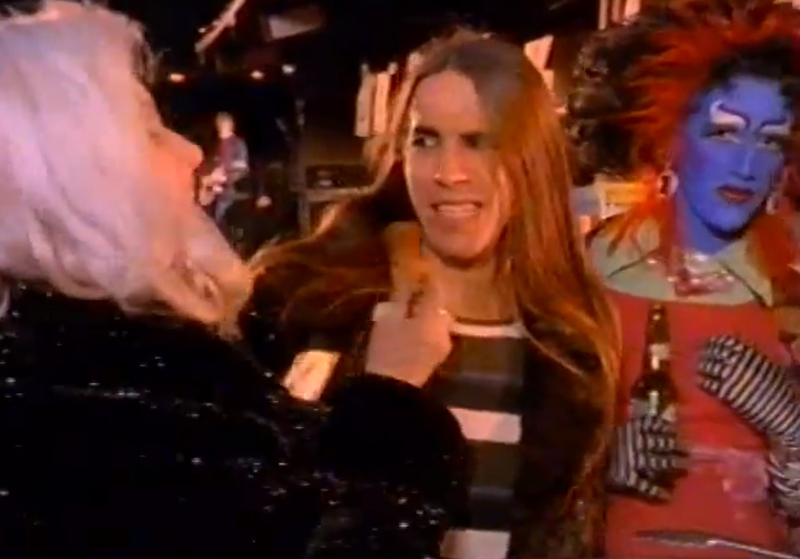 Like, when Anthony and Sofia go to see Kim and Thurston onstage at some divey bar, the audio's queued up to a Chili Peppers song called "Nobody Weird Like Me," which I'm pretty sure Sonic Youth never actually covered. 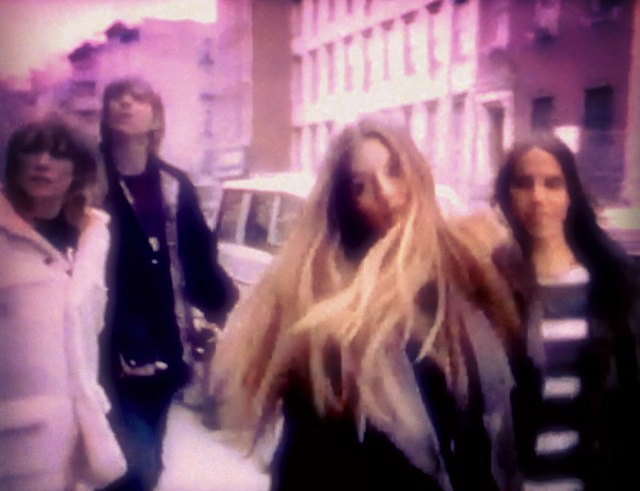 The notion of Sonic Youth playing a Chili Peppers song is mildly amusing, maybe, but mostly the whole audio sitch is annoying and distracts from the weird beauty of the movie. So what I'd recommend is muting the video and putting on something from 1993 that you haven't listened to in ages, like Saturation by Urge Overkill or the first Souls of Mischief record or whatever you feel like. Sofia and Anthony eventually escape and duck into a bar, where Kim Gordon and Thurston Moore are playing a daytime show. In the middle of their set Anthony and Sofia get onstage and start slamming around and headbanging and it both delights and embarrasses me. But at the end of the day I'm in support of the slamming/headbanging, largely because I think it's neat that Anthony seems to have zero concern for the fact that his dance moves are way out of alignment with Sonic Youth's vision of maximum aloofness. And it's chill of Sofia, that she just went for it and played along, despite totally existing on the Kim/Thurston end of the enthusiasm spectrum. Also, Anthony and Sofia's hair is so intense and bountiful, and I hope that the two of them had some awareness back then of how special it is to be in love with someone who has the exact same hair as you. If you're very lucky, that kind of love comes twice in a lifetime at most. At the Kim-and-Thurston show they're serving free chips and buffalo wings and Debbie tries to make Anthony eat a buffalo wing and he's really not into it. But it's a great idea, the free buffalo wings. 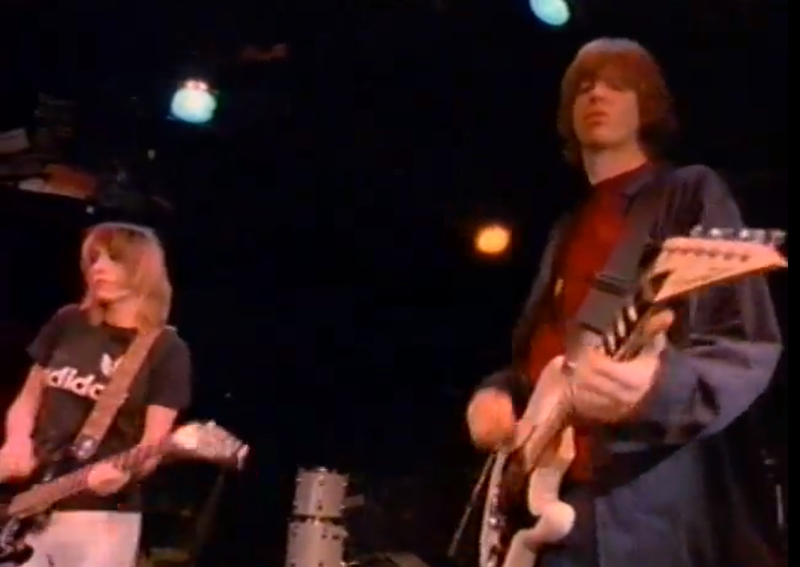 I'm going to see Thurston Moore this Friday night, actually - do you think there'll be free buffalo wings there? I feel like it's the least Thurston could do for us at this point. Anthony and Sofia run away from Debbie again, this time with Kim and Thurston; they all go to a guitar shop and shred their faces off and, again: it's so embarrassing! And so delightful! I tried to get a screenshot of Kim standing behind Sofia and doing that sleazy dude-move of reaching over your shoulders and going "Hey baby, here's how you play a C chord" or whatever, but it came out too blurry. Too hot for YouTube or something. Anyway - in the middle of the shred sesh Debbie shows up and steals Anthony and tries to make some evil barber-dude cut off all his hair. 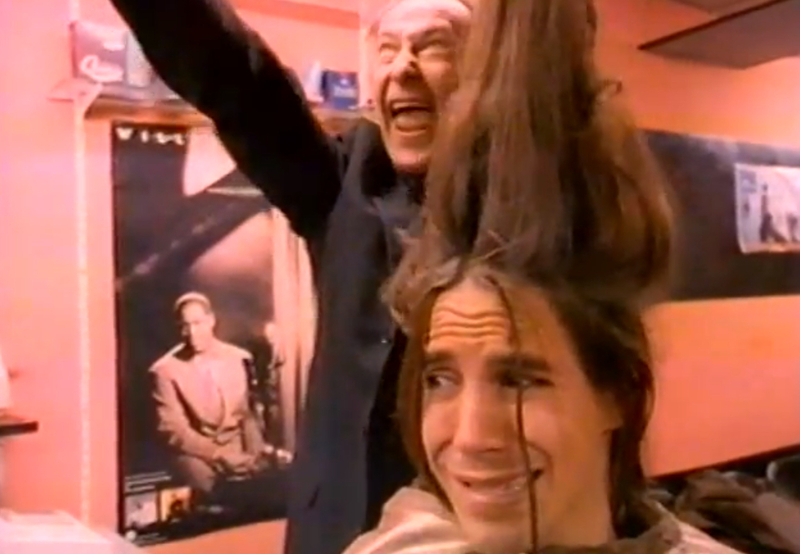 And then it's time for Anthony's big rock star debut, which is at Wigs & Pizza Boutique. That was a real place, right? I feel like it's something I read about in magazines when I was a kid, but I can't find any mention of it anywhere on the Internet. P.S. Do you think Sofia Coppola's ever drunk from a bottle of Budweiser in her life? My guess is: no, she probably hasn't. Spoiler alert, the movie ends with Debbie falling in love with Sofia and the two girls kissing delicately and then Anthony taking all his clothes off and running out into the street in his underwear. I was going to add that the girls' kissing's delicate to the point of being lame, but who am I? Who am I to judge Debbie Harry and Sofia Coppola for not sloppily, rabidly making out with each other at a wig shop/pizza restaurant in 1993? I'm just happy they showed up, especially Debbie, with her fantastic black eyeshadow. I'm going to be Debbie Harry for Halloween this year, and if I can get my eyeshadow even half that tough, I'll just be so proud.